The Kingdom of Norway is one of a small group of NATO member states that in recent years has consistently modernized its armed forces and made substantial efforts to strengthen its military security. Actions taken by the authorities in Oslo for the development of the defense system may be regarded as a model of how to plan qualitative and quantitative changes in the country’s armed forces and structures of military security. Norwegian plans for development of the armed forces have showed that it is possible to create a well-functioning system of defence planning in small and medium-sized countries, which takes into consideration the following conditions: budgetary constraints in financing the armed forces, a country’s strategic defence needs, properties and dynamics of changes in the security environment of the state and evolution of the nature and scale of military threats. The currently implemented program of transformation and technical modernization of the armed forces was initiated with the decision of the Ministry of Defence of Norway (nor. Forsvarsdepartementet) on October 1, 2014, which assumed conducting a strategic review of defence (Strategic Defence Review). As a result in 2015 a team working under the guidance of the Chief of Defence of Norway (nor. Forsvarssjefen) presented a comprehensive document where its authors not only made a comprehensive analysis and evaluation of the operational capacity of the Norwegian armed forces (nor. Forsvaret), but above all, formulated a long list of proposals and recommendations for the future of the Norwegian army and the Norwegian defence system. The main thesis contained in the Strategic defence Review was the statement that the strategic components of the Norwegian defence system were characterized by insufficient (in relation to the specific nature of direct and indirect threats to Norway’s security and its vital interests) capabilities of combat, inappropriate, too slow, reaction and too weak resistance to hostile military action. The authors of the document stressed that both in quantitative and qualitative terms, the Norwegian armed forces were not capable and ready to conduct a full and wide range of tasks arising from the strategy of national security and defence doctrine of the country. According to civilian and military experts, who in 2015 prepared Norway’s defence review, the Norwegian armed forces require a comprehensive and profound transformation program of defence structures. Identification and intelligence (from tactical to strategic level), which would supply command centres and policy makers with the latest and reliable knowledge about the real military potential of hostile countries and potential and real threats to national security. Acquiring such information is to be performed with the use of offshore platforms and air and stationary systems and satellite systems. Forces and means of the so-called First Line of defence. They will ultimately include: ships and submarines (Fridtjof Nansen frigates, fast corvettes Skjold type, submarines of the new generation), military armoured and mechanized units, multi-purpose combat aircraft F-35 Lightning II, and finally mobile and stationary anti-aircraft and anti-ballistic systems of middle and long-range (NATO: short and medium). In peacetime the activity of military components ‘of the first line of defence’ would be focused on deterring potential aggressors and limiting freedom of enemy actions with the use of military means within Norway’s security environment and the areas where Norwegian political and economic interests are present. Civilian and military infrastructure necessary for the smooth and timely adoption of allied forces of NATO on Norway’s territory, deployed to Norway to repel enemy aggression and demonstrate readiness to defend its sovereignty and territorial integrity. The army – one mechanized battalion, one armoured battalion, no fewer than 3,000 soldiers of the Rapid Reaction Forces, as well as a system of mobilization allowing, in a war situation, to develop the army up to 30,000 soldiers. The naval forces – 5 frigates equipped with NH-90 helicopter, at least 6 missile corvettes, no less than 4 submarines, 5 units for mines combat, 1 logistics ship, 2 support ships for large marine groups, 8 large and medium-sized patrol ships with landing decks for NH-90 helicopters. Air force – at least 42 combat aircraft F-35 Lightning II, 4 maritime patrol aircraft of long-range, several unmanned means of mid-range reconnaissance, at least 14 naval NH-90 helicopters, 16 transport helicopters, 4 transport aircraft Lockheed Martin C-130J Super Hercules, a battalion of missile launchers of mid range (NATO: short) of NASAMS system, access to strategic air transport – Boeing C-17 Globemaster III. Within intelligence and strategic reconnaissance units – one large naval unit designed for observation and electronic surveillance and an extensive network of fixed centres of early warning and surveillance in the northern part of Norway. Following the guidelines set out in the Strategic Defence Review from June 17, 2016 the Parliament of the Kingdom of Norway (Storting), acting at the request of the government, accepted the most important current document defining the direction and the nature of the transformation process of the Norwegian armed forces. It is entitled: Capable and Sustainable – Long Term Defence Plan. The previous plan of evolution and development of the Norwegian defence system was announced in 2012, which meant that a significant part of its objectives, taking the dynamically changing conditions of European security, proved to be out of touch with reality in the second half of the second decade of the twenty-first century. Adopted in June 2016 the new Long Term Defence Plan provides a framework for Norwegian defence planning in the years 2017-2020. At the strategic level of the analysis, the authors of a long-term defence plan deemed it necessary and inevitable for the government to initiate and successfully conduct significant strengthening of the Norwegian armed forces and the Norwegian defence system. The Long Term Defence Plan of the Kingdom of Norway unequivocally and unconditionally obliges state authorities to introduce no later than in the third decade of the twenty-first century selected types of weapons of strategic importance from the point of view of the Norwegian military security. Firstly, in accordance with the provisions of this document, the Norwegian Air Force should acquire 52 F-35 with a full set of weapons. They need to be equipped with Norwegian air-water missile systems – Joint Strike Missile. Secondly, no later than in the middle of the third decade of the 21st century the Norwegian Navy should initiate the process of introducing submarines of the new generation (in place of Ula class submarines) prepared to operate in open ocean and equipped with missiles capable of destruction on-surface targets. After the initial selection, in February 2017 the Ministry of Defence decided that Norway will purchase four submarines in the German shipyard corporation TKMS. The plan is to sign the common contract for the new submarines in 2019. The Norwegian submarines will be based on the 212-design, already in service in Germany and Italy. Thirdly, the Norwegian authorities were obliged to replace the aging maritime patrol aircraft Lockheed P-3 Orion aircraft with new generation long-range aircraft. The government has initially announced the acquisition of Boeing P-8A Poseidon. Finally, further development is expected of antiaircraft and antimissile defence formations equipped with missile systems of medium and short range. Previously used in the Norwegian army NASAMS missile systems would be complemented by their mobile versions – fixed on crawler tracks and on wheels. In the opinion of the Norwegian armed forces the Army Mobile Ground Base Air Defence System will be a world leading solution with the unique capabilities to combat modern airborne threats. More importantly, however, the plans to modernize the artillery forces also assume the purchase of new missile systems designed to counter long-range air targets. In addition to these major modernization programs of the Norwegian armed forces implemented in the next few years, the authorities have initiated several equally important armaments programs, although not as expensive and ‘a media spectacle.’ In the next few years artillery forces would receive modern self-propelled howitzers. Coast guard forces would be equipped with new Arctic patrol ships with a large displacement (to replace units of Nordkapp type). In January 2015 deliveries of CV 9030 infantry vehicles began for Norwegian mechanized troops. The contract with BAE Systems Hӓgglunds AB assumes a delivery to Norway of 144 CV 9030 vehicles of different versions. The construction is underway of large ships of logistic support (length – 180 meters, displacement – 26,000 tons) for the Norwegian Navy. What is also worth stressing is that in 2015 the Norwegian intelligence services introduced a new reconnaissance Marjata ship to service, designed for monitoring and surveillance of military activity of other countries in the waters of the Far North (length – 126 meters, cost – 160 million euro). When making analyses and evaluations of each program of technical modernization and transformation of the armed forces it must be remembered that the key factor for achieving the assumed development goals is to ensure that the government would guarantee adequate financial resources. The process of increasing the funding in the Ministry of Defence was initiated in Norway in 2014. The Norwegian parliament agreed then to raise defence spending by 526 million Norwegian kroner – NOK (Norwegian krone average rates in 2016: EUR 1 – 9 NOK, PLN 1 – 2 NOK). As a result, the budget of the Ministry of Defence of the Kingdom of Norway reached 43 billion NOK. Expenses for investments (purchase of new equipment, modernization of equipment, infrastructure development) in 2014 amounted to 10,932 billion kroner. In 2015 Norwegian defence spending reached 43.8 billion kroner. 9 billion kroner of this amount was earmarked for investment expenditures (which accounted for 20 percent of the defence budget). In 2016 Norwegian authorities made a very significant increase in terms of defence spending. For the maintenance and development of the national defense system 49 billion Norwegian kroner was provided (investment expenditures reach 12.4 billion kroner, which represents 25 percent of the defence budget). When considering the financial issues that determine the implementation of the transformation of the armed forces, it is also worth noting that all initiated and consistently pursued programs of purchasing or upgrading weapons are always long-term targeted programs with funds guaranteed by the parliament. Summing up the individual target programs, it can be concluded that in the years 2015-2018 44 billion Norwegian kroner was guaranteed on their implementation (of which 47 per cent is allocated to the F-35 Lightning II). In the years 2019 – 2023 expenses on modernization of the Norwegian armed forces would reach 61 billion kroner (still 45 per cent of this amount will be allocated to the F-35). Norwegian programs of reconstruction and technical modernization of the armed forces are always preceded by a sequence of in-depth and comprehensive review and evaluation of the concepts of military security of the state. Norwegian plans for transformation and defence programs are regularly adjusted to the changing needs in defence and current and future conditions of military security of the country. The Norwegian system of defence planning is dominated by medium-term plans, from 4 to 8 years. The objectives of modernization of the armed forces are strongly embedded in the realities of the public finances of the state. 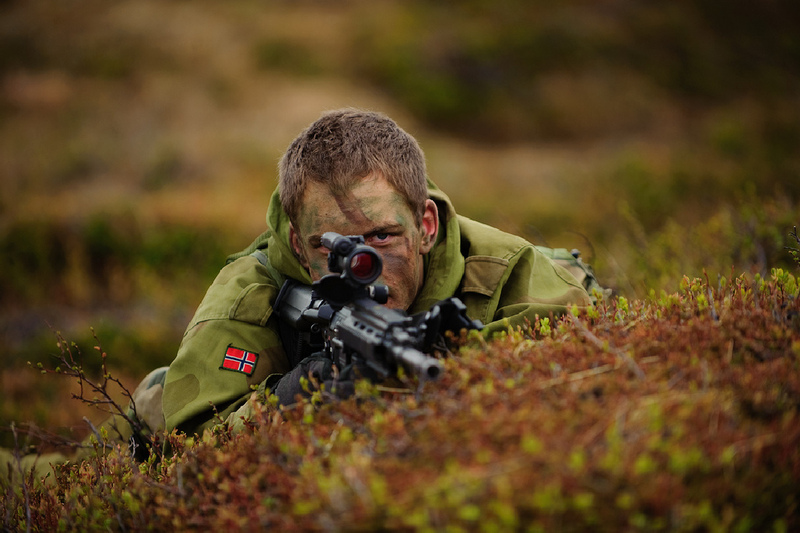 The Norwegian authorities, responsible for defense planning, make a precise selection of equipment needs of the armed forces and strictly ensure financial resources for the acquisition of specified types of weapons or equipment. In the following years, starting in 2014, the investment expenditures have been constantly rising in the structure of the Norwegian defence budget. The assumptions of the Norwegian program of transformation of the armed forces can be characterized by a trend of seeking specialization in selected areas of military both in the field of combat and operation capabilities. The applied solutions for defence planning and the Norwegian model of armaments programs could be used as a basis for the development of a new comprehensive system of planning and implementation of changes in the Polish armed forces of. The planning method of Norway’s armament policy should be analysed in the context of the currently being implemented Strategic Defence Review.